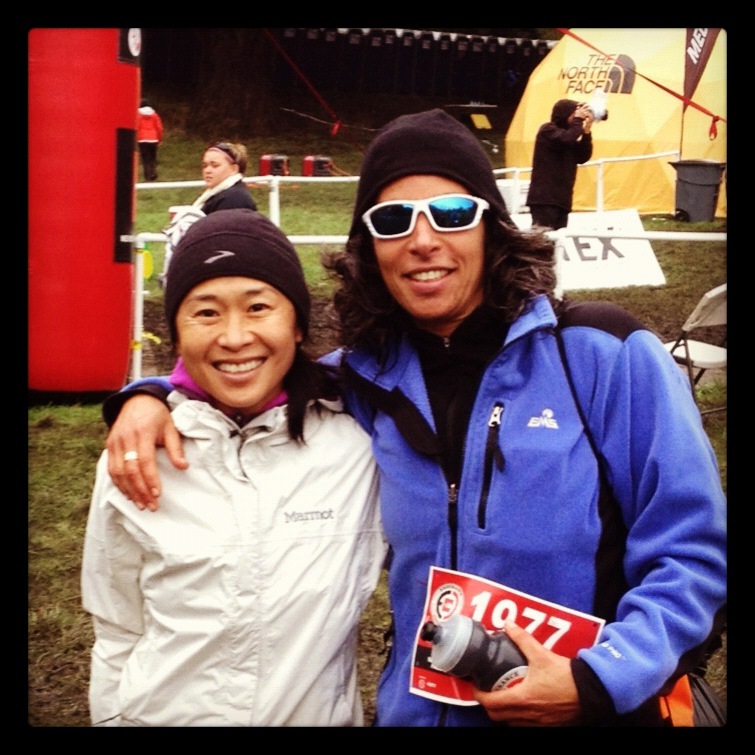 Due to unprecedented rainstorms in the Bay Area, the NFEC this year was one wet, muddy adventure. There was not a dry foot in sight. We lucked out with relatively mild temps (low 60’s) and no rain by the time our event began (11 a.m.). There was a slight tailwind going uphill that translated into a headwind coming down. The true challenge was the slippery sloshy terrain at the top and on the descent. I now know what it feels like to inadvertently glissade down a trail at 85% effort. It’s a miracle I didn’t do a face plant or pop a joint. I was thrilled with my time since I was not in great form going into this race. A pesky recurring virus took me down every 10 or so days between mid-October and 5 days before the event. Then a surprise episode of vertigo 6 days beforehand made me wonder if I should run at all. In the end I decided to go for it because I was tired of being a sloth. I set modest goals to have fun, complete the ascent without stopping, make it through unscathed, and match or better my time from two years ago (1:06:28). All were met. It was a great day. Thank you, running gods. Off these feet (Part 3): Chicken or fish? I’ve always been somewhat scared of the water. I know how to swim. I can get from one end of the pool to the other and maneuver for short distances in a lake or the ocean. But I would harbor varying degrees of anxiety doing it. I was a chicken. I hated feeling this way. It limited my enjoyment of the natural world, and now that I am a mother of boys who have no fear of the water, it limits my ability to keep my kids safe or at least have fun with them. I needed to set things right. In July I signed up for evening adult swim classes for a week — one hour a day for five days. The morning of day one, I got a call from the instructor. I expected to hear that class was canceled due to underenrollment. Instead she told me that because I was the only person enrolled, I could pick a more convenient time to have the lessons if I wanted, and, yes, they would be one on one. Panic. I should have been thrilled but all I could think was that I did not want all that attention on me. Day one of the lesson: I met my instructor. Her name was Anna and she was a competitive swimmer through high school and college. She also coordinated all the summer swim lessons for our neighborhood recreation center. Teaching qualifications – check. She asked about me. I told her about my panic attack in Donner Lake last summer 20 yards into my swim (basically I got early stage hypothermia, felt like I had a piano on my chest, and could not get any power in my limbs). So my goal, I told her, was not to be in that position again. I wanted get better at swimming, to feel comfortable doing it, and ultimately, to do a triathlon. She responded that the first step was to get a wet suit if I wanted to attempt Donner again. The rest she would help me with. She asked me to swim a freestyle lap so she could assess me. When I finished, she said I was actually better than some students she has had who had triathlons under their belt. Huh. Who woulda thunk it? She gave me tips on improving my freestyle then moved to breast stroke, which she was excited to work on because most triathletes use it as a fallback when they need a break. It turned out the breast stroke was the farthest thing from a break for me. It is powered by all the areas where I am weak: chest, upper back, abdomen, glutes and inner thighs. I also had been doing it all wrong, breathing at the wrong time, pulling my arms back the wrong way. What a mess. Day two: I rushed through 8:30 a.m. drop offs at soccer camp, then rushed home to get my swim stuff. With 10 minutes to go before my lesson, I plopped my gear in the back of my SUV, went to close the tail gate and heard a loud BONK! Just as I pondered where that noise came from, a dull ache came over my skull. That bonk was the sound of the corner of the tail gate door slamming down on my head. I touched the spot that the pain radiated from, looked at my fingers, and saw blood. I called Anna, “Um, I’m sorry to do this but I think I have to cancel today…,” explaining my predicament. She understood, hoped everything was okay. Then I went upstairs to look in the mirror. Yep, definitely still bleeding. I got on the Internet, googled “head laceration treatment.” I wanted to know if I needed to see a doctor or if I could just put antibiotic and a band-aid on it. The rule of thumb, apparently, is if the cut is longer than 1 1/2 inches and “smiles” (gives way and curves) when pinched, you need to seek medical attention. Dang, I thought. How was I going to get this done and pick up my kids in three hours? Day three: Seven staples, a good night’s rest, and a swim cap later, I was back at the pool. The nurse told me I could swim as long as I covered my head and kept the suture dry. The order of the day was more freestyle, working on turning my body to face the opposite direction as the reaching arm (not staying flat), keeping the hand of the reaching arm close enough to graze the side body from hip to armpit, then extending the arm as far forward as possible before pulling back, not spreading my fingers apart while doing all this, and keeping the legs lifted as close as possible to the surface of the water (not letting them drag down). I also worked on breast stroke fixes — snapping the legs together so that they touch and shooting the arms straight ahead quickly after the pullback. Day four: I was sore. My chest and inner thighs killed, evidence of having swum more breast stroke in 72 hours than I had my entire life. Anna reminded me that the only way to get over the soreness is to get the muscles accustomed to doing the work. So we did more breast stroke. Then she figured she’d give me a break and try out a couple fun things. Well, unlike the breast stroke, where I felt I had some potential to improve, two swimming skills my body simply was not designed for were the side stroke and flip turns. The side stroke was a sinking exercise for me. And my flip turns came out lopsided every time. I was so hopeless, it was comical. “So when you’re doing a triathlon, you’ll want to stick to the freestyle,” Anna advised. Day five: We went to the back stroke. On the demo lap, I rocketed across and back, realizing something odd — it felt like no effort. 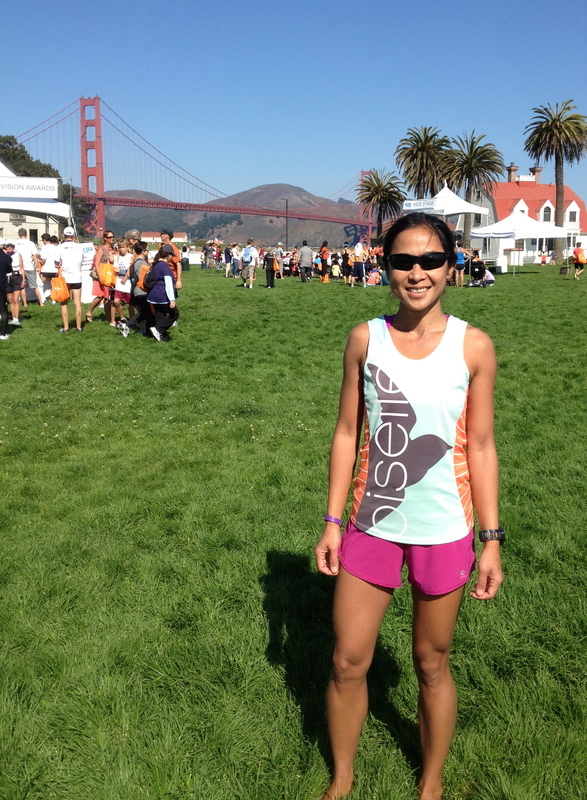 I asked Anna, “That felt easy – why?” She chuckled and said, “Because you’re a runner. That stroke is powered by legs, not arms.” Eureka – I found my fallback stroke! If only I had eyes on top of my head. Make up lesson: Anna gave me an extra day because of the day two debacle. We reviewed freestyle and breast stroke. Both felt more natural now. My rhythm was still off for breast stroke but I felt nimble and lithe doing freestyle. “You look comfortable and you’re actually getting fast. 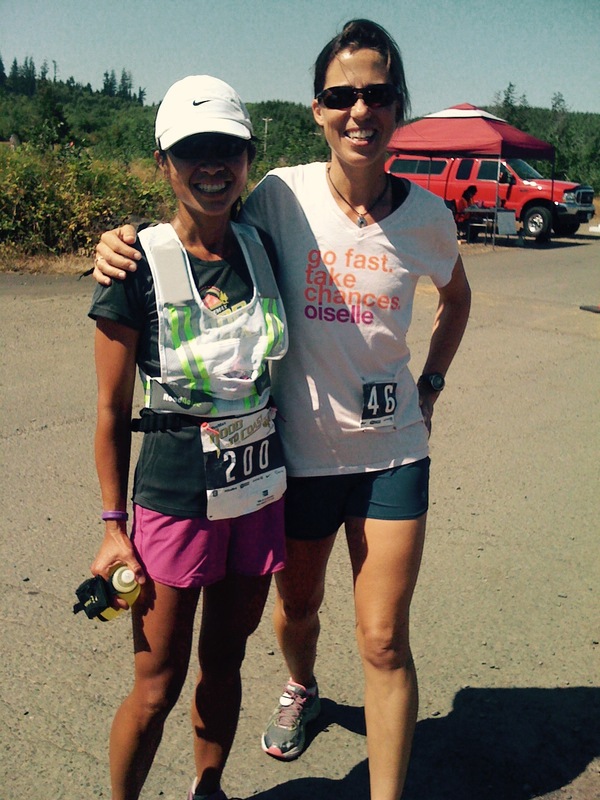 Remember to slow down to a pace where you can keep swimming longer,” Anna reminded me. Yes, of course; basic endurance strategy. She videotaped me doing freestyle and proudly announced that I had improved by leaps and bounds in just a week. I graduated. Frankenfish (yes, the staples were still in my head) was freed to practice swimming on her own. I needed no egging to go to the pool. First of all, the Summer Olympics were happening at the time and Team USA swimmers were sweeping up medals left and right. When you see folks swim so powerfully and elegantly, it takes your breath away. It makes you love the sport. What’s more, the pool became my refuge. It was a warm, refreshing and peaceful place to retreat to after a hot grueling run. Swimming was also something new and therefore interesting. I had no expectations and therefore could go easy on myself. Every lap in the pool was a personal best. That’s the beauty of trying new things. You can only get better at it. My eight-year-old still swims better than me (he’s the one who did the kiddie triathlon this summer), but at least I feel like the swimming pool is my friend. Next I need to make friends with the open water. I’ll save that for next summer. This chicken might one day become a fish after all. It’s November and I’m finally going to put my summer experience into words, in several parts. 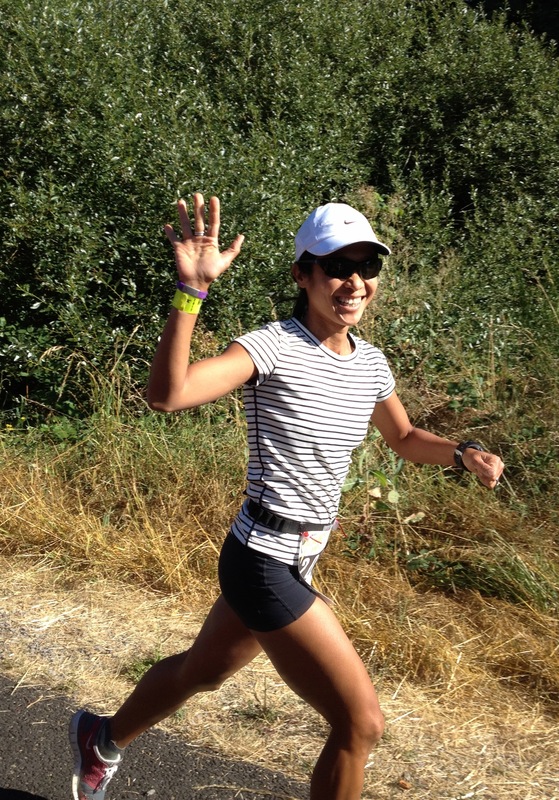 July and August were immense and changed me profoundly as a runner. Something so big cannot be encapsulated all at once. I need to take small bites, chew slowly and digest. 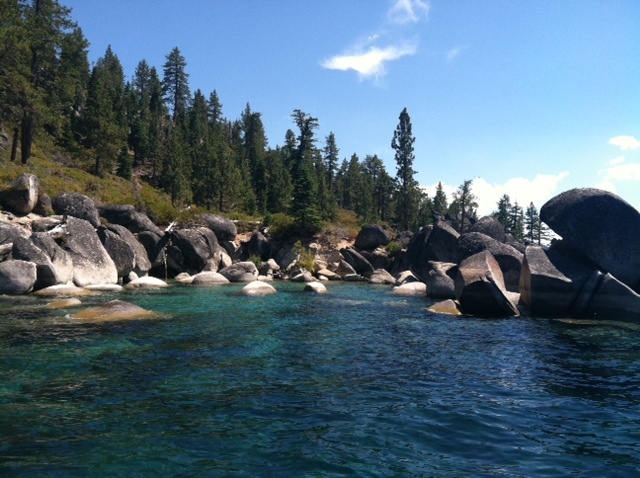 Our family carves out a chunk of our summer to stay at our place in Truckee, in the North Lake Tahoe area. Truckee is our playground. In summertime, life up there suits all of us. We are a family that likes being outside and needs to roam. Truckee gives each of us everything we need to thrive. This year we planned to spend the longest stretch of time there yet — 8 weeks. To say I looked forward to it is an understatement. 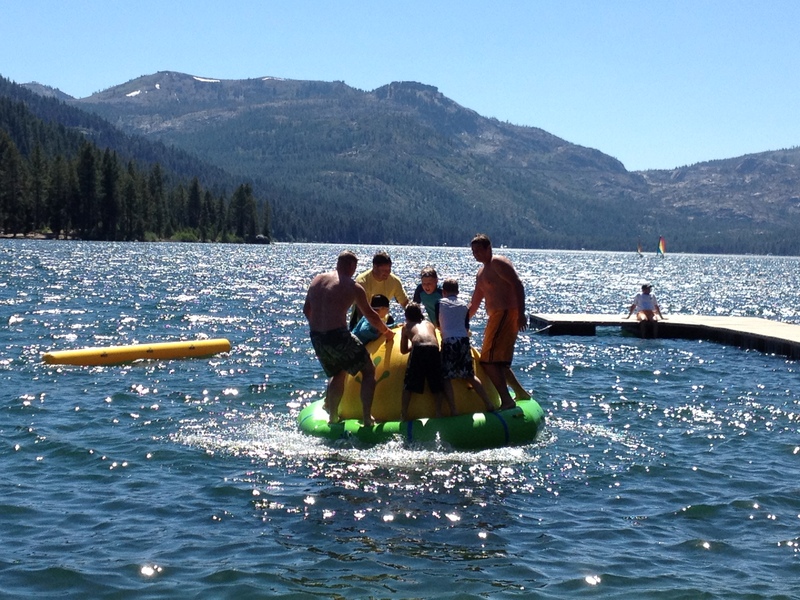 As I checked off the last few days of school in early June, I was living and breathing for Truckee Summer. As we vacationed at my in-laws’ home in coastal North Carolina, relaxing and fun in its own right, I was giddily anticipating waking up to the scent of evergreens, the sound of a train whistle echoing off mountain peaks, the bright sun, the limitless blue sky. I knew it would be divine. I had no idea it would be even better than I imagined. 1) I wanted to be optimally trained for Hood to Coast. 2) I wanted to get better at swimming. 3) I wanted to run more trails. Happily, I saw them all through, and even got a surprise bonus for my efforts. How many times in your life does something exceed your expectations in an abundance of unanticipated ways? I wound up uber-trained for H2C. I came to love swimming. I learned that the secret to my improvement as a runner was to submit to trails. I also grew to enjoy the solitude of training on my own because when you’re surrounded by nature, you don’t feel lonely. Nature is brilliant and alive; it is quiet in the best way. And the occasional runner who passed me on the road or trail would always wave and smile as if we had known each other for months. I was never lonely. 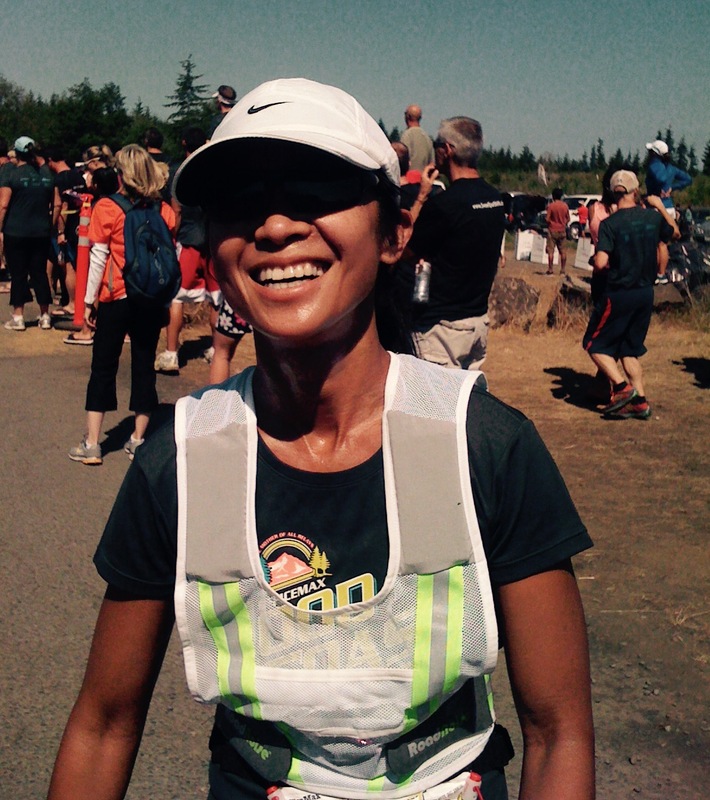 I learned that making time to do other things made me a happier runner. So I mountain biked. I went stand up paddling. I stopped being paranoid about busting my knees on the tennis court, played a lot and even took lessons. I’m still not very good but had a blast anyway. I grew enamored of small town living. Small local races where it’s not a hassle to get to the start line, there is no parking stress, no bureaucracy, and everyone knows everyone. The recent hurricane devastation in New York has brought forth myriad concerns. Mostly I have worried for the safety and well being of many friends and families of friends who live there. But as a runner I also lamented the unfortunate timing of this natural disaster vis a vis one of the greatest running events in the country: the New York City Marathon. The race is slated to occur a mere six days after Hurricane Sandy’s battering. Quietly, as not to show disrespect to the residents of New York who have suffered far greater hardships than having a marathon get canceled, runners like me all across the country have been pondering: will the race go on? There are many obvious reasons to cancel. In short, the city has bigger problems to solve than how to make the five boroughs accessible to 47,000 people who want to cover 26.2 miles on foot this Sunday. So it came as a surprise when Mayor Bloomberg boldly (perhaps even brazenly) announced yesterday that the race will go on. The mayor said: “It is a great event for New York, and I think for those who were lost, you know, you’ve got to believe they would want to have an economy and have the city go on for those who were left behind.” He wanted the race to be a symbol of the city’s resilience. Runners are not newcomers to symbolic acts. We often dedicate our efforts to some greater good beyond ourselves. Think of all the races that funnel their proceeds toward a charitable cause. And all the organizations that hold road races as fundraisers. In running, we push ourselves (to cross the finish line) to inspire others to do the same (overcome a challenge). As a fundamentally solitary endeavor, there is something personal and spiritual about running, and this makes it conducive to expressing values and beliefs. A good handful of this year’s NYCM entrants are charity runners — those who aspire to cross the finish line in support of a charitable cause. Now comes an opportunity for all NYCM participants to run the race for a cause. That cause is to lift the spirit of folks who call New York their home. I cannot say whether the mayor’s decision was the right one. (It seems on one level bullheaded and insensitive, as well as needlessly taxing on public resources.) But if the show will go on, let the race participants and their supporters come to New York nobly. Let them rally behind the battered city instead of expecting to be catered to by it. This is a time to check one’s sense of entitlement at the door — to be at peace with travel delays, to accept screwups with bag checks, fuel stops, shuttle rides and what-not, and to not complain about lack of crowd support. So run strong for the New Yorkers, racers. Do it for them this time. When you put one foot in front of the other at mile 25, do it in honor of those struggling to put their lives back together. Share your strength with them. 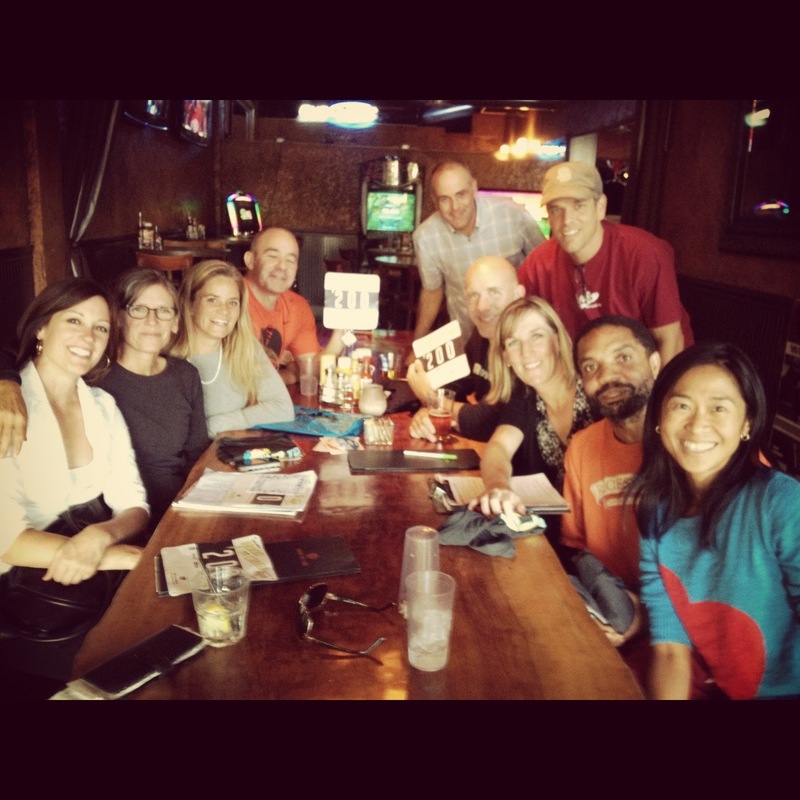 Make our tribe of long-distance runners proud.